For Fire Extinguisher Training Kent based ETC Fire can supply you with teaching and practical, hands-on experience of fire extinguisher operations. The HSE stipulates that all Employers, and/or building owners or occupiers) must carry out a fire safety risk assessment and keep it up to date. Also, they must provide adequate and appropriate fire safety measures to minimise the risk of injury or loss of life in the event of a fire. We can visit your premises to instruct your staff and since we are aware that many premises operate shift systems, we can visit any time, day or night, to suit your staff schedules. Eliminating or reducing the risks of injury via a fire will be effective if you carry out fire training regularly. For all the Fire extinguisher training Kent business owners and employees need, you can rely on us at ETC Fire - if you think your fire extinguishers in Kent are overdue for a check - call us on 01444 487821 or .... 07501 724865 or use our contact us page for a call back. All business and commercial premises are required by law to carry out a fire assessment and provide adequate fire extinguishing apparatus. However, using the right fire extinguisher or indeed knowing how to work one in an emergency can be a daunting prospect and fire extinguisher training is recommended to inform your staff of proper fire safety procedure and knowledge of how to protect themselves - as well as operating fire safety equipment where necessary. Training your staff regularly is therefore vital - updates every six months are recommended and it will give them confidence to fight a fire and potentially save lives and property. Hands on practice with a fire extinguisher is always desirable and our supervisors are able, if there is room and a safe area, to start a controlled fire and demonstrate how to extinguish it, which helps to prepare many people who worry that they might panic in this situation. 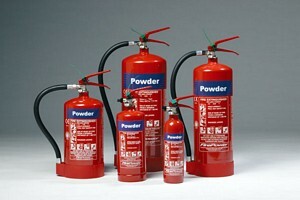 ETC Fire provide fire extinguisher training Kent companies, shops and offices, find very cost effective. If there were a fire in your premises, are you confident your staff know what to do? The HSE also insist on your properly maintaining your safety records and provision of adequate fire fighting equipment. We offer bespoke fire extinguisher training courses for your staff which is quick, efficient and aimed directly at their particular needs and situation. So what are you waiting for? Contact Us for all your Fire Extinguisher Training Kent areas.